Objective: Support, and therefore relieve, the metatarsi bones. 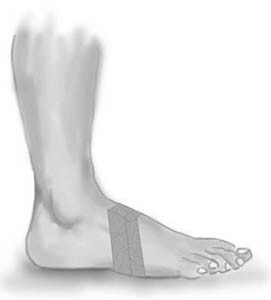 Application: A tape “anchor” is applied around the forefoot behind the toe pad (A). A new strip is applied in the same manner half overlapping the first and a little behind (B). If it is a large foot a third strip can be applied a further half tape’s width behind.